Our pal Dennis McBride, the Curator of History at the Nevada State Museum in Lorenzi Park, has agreed to be a guest blogger for us. The Nevada State Museum-Las Vegas recently was able to salvage an important piece of mid-century Las Vegas artwork from the Campos Building on the corner of Bonanza Road and Second Street shortly before the structure was demolished. The Campos Building was the first state office building built in southern Nevada. Like a lot of such projects, the Campos Building didn’t come to life easily. Las Vegas businessman Harrison Stocks offered the state a plot of land for a southern Nevada state office building at Fremont and Twenty-First Streets around 1951. With that promise in hand, the legislature approved the bond-funded project and then-governor Charles Russell signed the bill. But when it was time to begin construction in 1953, Stocks withdrew his land offer. Editorials in the Review-Journal made much out the state having a building with nowhere to put it, and urged Las Vegans to scour the city for a suitable piece of land. The City of Las Vegas came up with an undeveloped plot of land on the southeast corner of Second and Bonanza, close to the downtown core. The bond issue for the building was $320,000, and the building, designed by architect Richard Stadelman, promised to be “a modern design … of Class A construction.” Construction began in early January 1954. The cornerstone was laid in a Masonic ceremony on May 8, and state offices had moved into the building by early fall 1954. 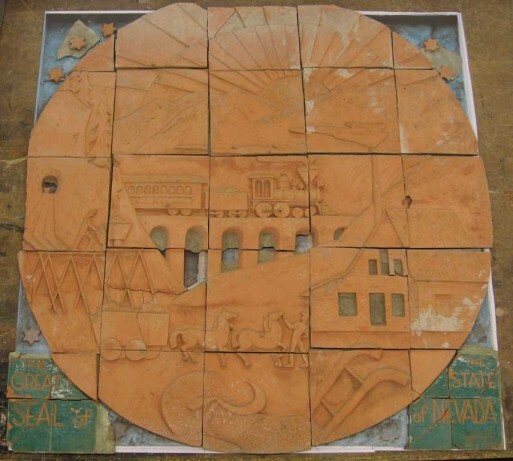 Set into the north wall of the state building, facing Bonanza Road, was a five-foot diameter unglazed terra cotta tile bas relief of the Great State of Nevada, designed by ceramicist Beth Bergh, who came to Las Vegas from Reno in 1951. Bergh opened B. B. Originals, a shop and studio at 1122 Bonneville Avenue in August 1954 where she taught classes and produced ceramics for sale. At that time two of her works decorated Las Vegas buildings: the Great Seal on the state building, and a glazed tile mural calledPeaceable Kingdom in the façade of the West Charleston Elementary School [today known as Wasden Elementary]. The last news we have of Bergh is from 1957 when she was preparing an exhibit in her shop. By 2006 the state building housed the Nevada Department of Parole and Probation and had been named for A. A. “Bud” Campos, chief of the department in 1971-81. The building was targeted for demolition in 2006, and the Public Works Board wanted to be sure Bergh’s artwork was saved if something could be worked out with the Nevada State Museum. The deal was made, and a few days before demolition began, Public Works delivered the seal in a thousand-pound block of concrete cut from the wall. Unfortunately, the block was delivered upside down, and when workmen tried shaving the concrete to a more manageable size, vibrations from the saw shook the tiles loose. What might have been a disaster, however, turned out to be good luck, since most of the tiles fell out of the wall intact, and those left were easily removed. The work then was to clean, repair, and store the individual tiles until the Nevada State Museum moves into its new building at the Las Vegas Springs Preserve and the bas-relief can be reconstituted and put on display. The job of cleaning and repairing fell to me as Curator of History for the Nevada State Museum-Las Vegas. For several weeks I brushed and scraped the unglazed tile, chiseled grout and concrete away, scrubbed and repaired as far as possible. Cleaning the artwork revealed several old breaks that had been repaired sometime in the past, including what turned out to be a bullet hole from vandals. 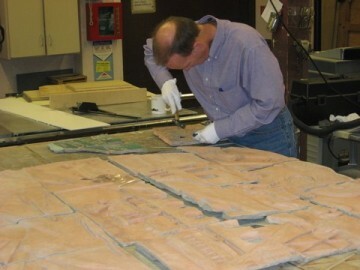 Once the seal had been cleaned, I wrapped each piece in acid-free tissue and boxed it in anticipation of the museum’s move next year. Little more is known of Beth Bergh and her work. Her Peaceable Kingdom at Wasden Elementary School was destroyed sometime in the 1990s, so the Great Seal is the only piece of her local public work to survive.